For one quarter of Saturday night's first CFL game, it looked like rookie head coach Dan Hawkins and the Montreal Alouettes might have found a way to turn their season around. 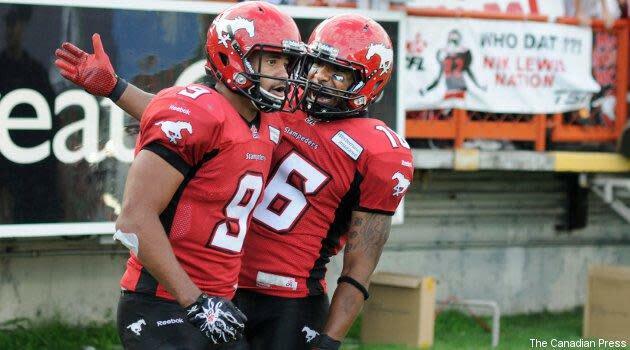 They scored 24 points against the Stampeders while not allowing any, and looked well on the way to victory. Comeback, thy name is Calgary, though, as quarterbacks Kevin Glenn and Bo Levi Mitchell combined to help the Stampeders score 35 straight points and hang on for a 38-27 win. That gives Calgary the largest comeback after the first quarter in CFL history, which is remarkable. It's a huge win for the Stampeders, and one that leaves the Alouettes with plenty of questions to answer going forward. This win demonstrated Calgary's resiliency. It would have been easy for the Stampeders to throw in the towel after the way they were manhandled in the first quarter, but they just kept fighting even when things appeared hopeless. The most poignant example came on a Noel Devine return just after Calgary had taken the lead in the third quarter. Devine's return looked like a sure touchdown, but defensive back Fred Bennett refused to give up, catching Devine near the end zone and punching the ball loose. The ball then rolled out of bounds, giving the Stampeders possession. Bennett's play was symbolic of how Calgary's players responded all day after the first quarter: rather than get frustrated or wait for next week, they just kept chipping away and eventually pulled into the lead. By the time the Stamps finally got ahead of Montreal, they were firmly in command of the game and were able to hold on for the victory. Calgary's win didn't come without cost, as while Glenn played pretty well (18 completions on 27 attempts, a 66.7 per cent completion rate, 204 passing yards, one touchdown and one interception), he suffered an apparent elbow injury in the third quarter and didn't return to the game. That could potentially leave Calgary in dire straits, as starter Drew Tate is still recovering from an arm injury and was unavailable for this game. They do seem to have a capable third-stringer in Mitchell, though, as he stepped in and completed seven of 13 passes (53.8 per cent) for 49 yards and two touchdowns while running four times for 33 further yards. Moreover, they received a great rushing performance from Jon Cornish, who ran 10 times for 105 yards and a touchdown (helping to prove that the old "you can't run if you're behind" adage is foolish) and added four catches for another 20 yards and a touchdown. Thus, they may not be completely doomed if both Tate and Glenn are unavailable next week. Glenn's injury could still be a significant problem for them, though. For Montreal, this loss is extremely concerning. They had this game in their grasp, but they just let it slip. There are plenty of issues to look at after this one, including the ongoing offensive line struggles, the passing game's lack of consistency, the ground game's inability to move the chains and the defence frequently getting burned, and you can bet Hawkins will have a lot of questions to answer this week. The Alouettes aren't doomed for the year, obviously, as they're only 1-3: remember, B.C. started 0-5 before winning the 2011 Grey Cup, Toronto was 1-2 (and 9-9 at the end of the season) before winning last year's Grey Cup and even Marc Trestman's famed 2008 Montreal team started 2-3. Still, there are major issues with this Alouettes' team, and Hawkins and company will have a lot of work to do to address them. For Calgary, this will long be remembered as one of the CFL's greatest comebacks: for Montreal, it will be the one that got away.